This sepia colored postcard shows the twenty-seventh President of the United States William Howard Taft on the steps of the capitol in Topeka, Kansas. The president spoke to the crowd of citizens and civil war veterans, who were attending the Semi-Centennial State Wide Reunion of the Grand Army of the Republic. 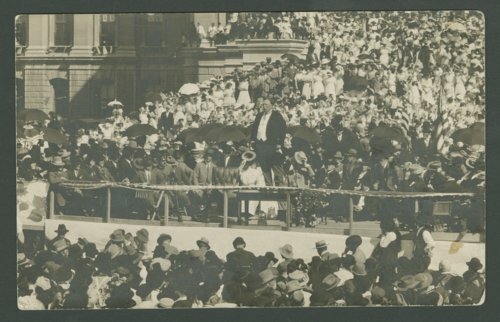 Prior to the speech, President Taft dedicated the cornerstone of the Grand Army of the Republic (G.A.R.) Memorial Hall building at Tenth and Jackson Streets, east of the capitol.